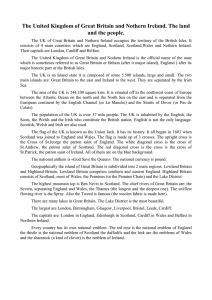 The United Kingdom of Great Britain and Northern Ireland, commonly known as the United Kingdom (UK) or Britain, is a sovereign state in Europe. Lying off the north-western coast of the European mainland, the country includes the island of Great Britain—a term also applied loosely to refer to the whole country—the north-eastern part of the island of Ireland and many smaller islands. Northern Ireland is the only part of the UK that shares a land border with another state (the Republic of Ireland). Apart from this land border, the UK is surrounded by the Atlantic Ocean, with the North Sea to its east, the English Channel to its south and the Celtic Sea to its south-southwest. The Irish Sea lies between Great Britain and Ireland. The UK has an area of 93,800 square miles (243,000 km2), making it the 80th-largest sovereign state in the world and the 11th-largest in Europe.The United Kingdom is the 22nd-most populous country, with an estimated 64.5 million inhabitants. It is a constitutional monarchy with a parliamentary system of governance. Its capital city is London, an important global city and financial centre with an urban population of 10,310,000, the fourth-largest in Europe and second-largest in the European Union. The current monarch—since 6 February 1952—is Queen Elizabeth II. The UK consists of four countries: England, Scotland, Wales, and Northern Ireland. The latter three have devolved administrations, each with varying powers, based in their capitals, Edinburgh, Cardiff, and Belfast, respectively. The nearby Isle of Man, Bailiwick of Guernsey and Bailiwick of Jersey are not part of the United Kingdom, being Crown dependencies with the British Government responsible for defence and international representation.The relationships among the countries of the United Kingdom have changed over time. Wales was annexed by the Kingdom of England under the Acts of Union of 1536 and 1543. A treaty between England and Scotland resulted in 1707 in a unified Kingdom of Great Britain, which merged in 1801 with the Kingdom of Ireland to form the United Kingdom of Great Britain and Ireland. In 1922, five-sixths of Ireland seceded from the country, leaving the present formulation of the United Kingdom of Great Britain and Northern Ireland. The UK has fourteen Overseas Territories. These are the remnants of the British Empire which, at its height in the 1920s, encompassed almost a quarter of the world's land mass and was the largest empire in history. British influence can be observed in the language, culture, and legal systems of many of its former colonies.The United Kingdom is a developed country and has the world's fifth-largest economy by nominal GDP and tenth-largest economy by purchasing power parity. The UK is considered to have a high-income economy and is categorised as very high in the Human Development Index, currently ranking 14th in the world. It was the world's first industrialised country and the world's foremost power during the 19th and early 20th centuries. The UK remains a great power with considerable economic, cultural, military, scientific, and political influence internationally. It is a recognised nuclear weapons state and its military expenditure ranks fifth or sixth in the world. The UK has been a permanent member of the United Nations Security Council since its first session in 1946. It has been a member state of the European Union (EU) and its predecessor, the European Economic Community (EEC), since 1973; it is also a member of the Commonwealth of Nations, the Council of Europe, the G7 finance ministers, the G7 forum, the G20, NATO, the Organisation for Economic Co-operation and Development (OECD), and the World Trade Organization (WTO).